St. Clairsville, OH (November 16, 2018) — Belmont College will be holding a Holiday Open House on Thursday, November 29th from 10:00am until 7:00 p.m. at the Main Campus location in St. Clairsville, Ohio. Belmont College students Macy Shiver, Emily Street, and Cierra Peck. Prospective students and their families are invited to meet and talk with college faculty and staff, receive assistance with admissions and financial aid, and tour the newly renovated campus. 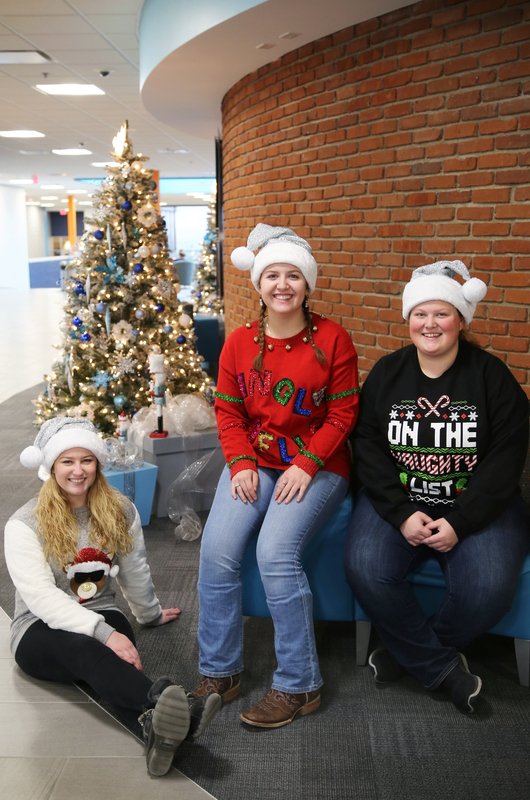 Attendees are encouraged to wear their favorite ugly sweater or holiday outfit and win great prizes, as well as warm up with hot chocolate, enjoy delicious cookies, and register for classes! Information regarding the college’s Be Connected initiative will be available, which provides an iPad for every student, faculty and the majority of staff members for integration into every facet of student life from enrollment to graduation. Through Be Connected, the iPads help save students money on textbooks, as well as enhance the way Belmont College teaches and prepares students for the technology-driven careers that await them. For more information about Belmont College or the November Open House, please call 740.695-9500.